This is the IEEE 802.11a/b/g point to multipoint. 2.4 or 5 GHz one radio AP with 60-90º sector antenna does line-of-sight coverage with radius about 3 km (might be more depending on locality) and provides 25 Mbps of real data throughput to CPE. Recommended CPE’s quantity to one radio is up to 15. For urban areas are usually used 5 GHz (more free and non-overlapping channels) and for rural areas work well 2.4 GHz networks. This is typical scenario of WISP access network. This is the IEEE 802.11n wireless point to multipoint which delivers several times higher throughput than 802.11a/g. 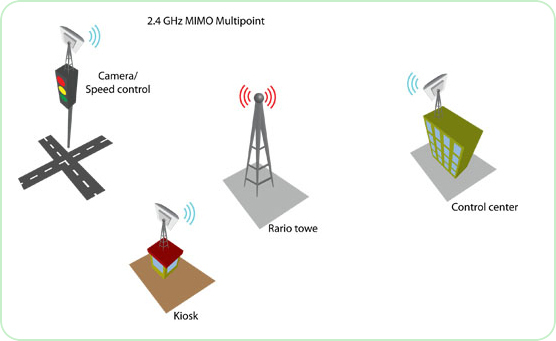 Our Manufacturer AP/CPE support 2×2 (2 transmit and 2 receive) MIMO technology. Such devices are equipped with dual polarization antennas which increase the reliability too. One MIMO radio provides up to 160 Mbps of real data throughput to recommended 20 CPEs. Point to multipoint’s primary target is data transmission but can relay VoIP too. 2.4 GHz coverage (depending on antennas) can be about 4-5 km, 5 GHz about 3-4 km.